The first Bass I ever owned was a Juzek plywood bass. Although my teacher at the time told me not to get the Plywood model, budget made that decision for me. I had saved up about $200 over the summer in 1966 working at my Uncles costume jewelry warehouse. Back then minimum wage as just over a buck so I grossed about $50 a week or so. After train tokens and lunches not to mention taxes I had barely half left. \nI went down to Metropolitan Music at 222 4th ave, NYC and got my first Bass. It was the basic Plywood with cover, Seifert Bow, Petz Rosin, music stand, rock stop and Tuning fork. With Tax this ran about $192 and change. The Bass itself was $150. The lowest priced carved Bass was $200 and was out of reach with what I had saved. \nLater on after selling that Bass to a Music store and owning an old German/Czech Juzek style shop Bass, I went back and bought their Master Art 3/4 model. They only had one like this and a 7/8ths as well in the back warehouse. After school over the years I had gone down there to look at the other Basses and just waited till the time came when I could get one. \nIt was in 1971 right after recording the MMO records I had done that I went Back for the Bass I had seen since at least 1966. This was the Juzek family selling these as Met. Music was the business they had started about 40+ years earlier. The eldest there was Robert Juzek (brother of John Juzek, the labeled name) and his son Bobby Juzek would always be there working the counter if someone walked in. I told him I wanted to finally buy that Bass in the back so we both walked over and I pointed it out. The 7/8ths next to it had WBW in black script engraved under the famous Juzek emblem. \nAt that time the 3/4 Master Art was listed for $1700 in their catalog on the front counter. Everything was 50% off from them regardless of who you were. Maybe dealers or stores got a little more off but I remember that my old mentor, Luthier Andre\' Fantoni hated them because he would sell at almost the same price he could buy it for. Met. Music sold Spirocores then for $12 and at the shop Fantoni got $16 because he bought from a dist. and had to mark them up a little. Met.Music bought directly from Thomastic as a dist. but sold direct to the public. \nWhen Bobby went to tell his dad I was buying this Bass he threw a fit right in front of me yelling in Czech nearly scaring me into soiling my pants! Bobby came over to me an explained that this was an old bass and they can\'t get these anymore. They would have to charge me more if I wanted it as the catalog on the counter was very old as were the prices. The $1700 was a net of $850. He told me his dad wanted $875 for the Bass. Whew.. .. Only $25 more.. Ok.. sure.. So I pulled out the cash I had saved and paid for it. \nThey put the bridge in place and strung it up for me. While testing it out the D string sounded funny. I was by the long workbench that lined the back wall/windows with a worker every 6-8 feet or so adjusting mainly violins for orders and a cello or two. By this time, I had read Elgar (had just turned 20) and learned a few adjustments myself. I asked the worker closest to me if I could borrow his rat tail file for the bridge and pointed to it. English was NOT the language spoken in that shop by far. He handed the file to me, I took off the D, filed the angle a little different into the tailpiece and fingerboard and then tuned the D back up. Now the Bass sounded better as the D slot was now angled correctly facing the tailpiece. The worker looked at me and nodded with a \'hummm\' (like this kid knows something). \nA year or so later I was in a car accident and the Neck was broken damaging the ribs at the block as well as the Top and Back. Victor Venegas told me to call Alfonse Vavra as he was the best guy for the job. When I called him, he tells me he is too busy and to take it to his friend Peter Eibert who was just as good in his words. I get a ride up and when he comes to the door I was shocked but pleasantly. It was the guy from the workbench at Juzek that I borrowed the File from. \nPeter went on to do quite a few repairs over the next few years on some Basses I had acquired and learned a bit from him as well. He was from Germany having worked before for Heinrich Lang in Nuremberg since the age of 14 and he was 25 years older than me as well. 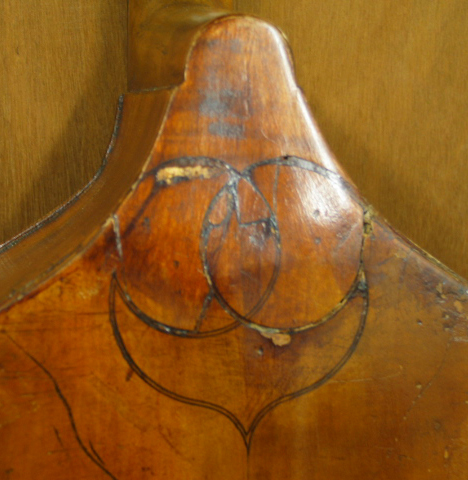 His master was related to the Langs that made the early Gamba and Plywood Basses for Juzek and my Master Art was actually labeled Wenzel B. Wilfer. \nA few years later I picked up a 7/8th Juzek type Master Art and it was labeled Anton Wilfer. This was the same as my 1966 WBW but much older and a richer looking Varnish. Peter Eibert would go on to tell me the story about the Juzeks and the history of their import business. \nAlthough the history is on the MetMusic website, learning from one of the elder workers knowing the Juzeks from both USA and Germany (after WWII) I was able to map out just a bit more than the average person. \nJohn Juzek had never made a single Bass as he was a violin maker and may have made a cello or two. After WWI, John and Robert (and possible a 3rd brother) made an import business of Violins and later added Basses as history shows us but there are no dates recorded. I cannot say that I have seen many Juzek \'labeled\' Basses from before 1930 but I am sure a few were purchased for the US market at some point in the beginning. These were mainly for the Schools as they were considered student instruments. Orchestra professionals bought older Basses back then and before long war broke out in Europe. This was the reason that Kay started making Basses and Cellos because exports had stopped from Germany and Czech. \nI went to Music & Art High School and all but one or two Basses were Juzeks as well as the other String instruments. Today we see these basses used and favored by many Jazz players and as 2nd Basses for some Orchestra players as they have mellowed over time with many Basses being 40 to 70 years old. \nFor the record, the finer carved Basses bearing the Juzek label were made by 3 generations of the Wilfer family being Anton, Wenzel and Emmanuel. I have learned that this cottage industry of making was centered around Shoenbach bordering both Germany and Czechoslovakia. After WWII, many of the workers moved over to the German side to avoid communist rule. At this time Robert Juzek made direct contracts with the shops and pushed his brother John out of the business for whatever reason. Robert was always the main brain in the family business traveling back and forth to Europe to the shops for instruments. \nIn conclusion, if you have a Bass labeled Juzek it was most likely put on here in USA and made by one of the Wilfers for the most part. They did buy from others if needed from what I have heard but even some of those could be Wilfers made for another importer. Most pre-war models were made in the 1930s in both Czech and Germany but after WWII, all the Basses were coming from Germany. The bulk of what I have seen have been German made post WWII but I have seen at least a dozen older Basses that I suspect some could be from the 1920s. \nFor other Shop type Basses, read about Pfretzschner/Morelli here.. I just got in a 1933 Gamba 4/4 Juzek made in Czechoslovakia, as labeled. \nBefore I go on about this particular bass I have to tell a short story and also why the title of this thread is now changed to (Lang or Wilfer), with the name Lang added. \nGoing back in time to about 1980 in Frankfurt Germany at the music fair when Bobby Juzek (son of Robert, John\'s/Jan\'s brother, hence John\'s nephew) told me that the cheaper basses were made by Lang and the better ones by Wilfer. He then walked me across the aisle to meet the current Wilfer (Rudolph?) heading up the Emmanuel Wilfer firm. \nFrom his description, I figured he meant that just the plywood models were made by Lang. Back then, the only reference I had for Lang was the son\'s firm in Mittenwald post WWII which was known as a commercial business making basses. \nLast year a 5-string Benedict Lang 5-string came in the shop and my eyes lit up. It was later dated by someone (maybe penciled inside) as from 1910. I didn\'t get the bass because it was a 4/4 model and 5s are slow movers as well as already having one in stock. Also, it needed a bit of work inside so I passed on it. What I did do however was research this maker/brand and found several of them around including a few that had both the Purfled back design we see on Juzeks with the Benedict Lang brand in a circle. At that moment, from seeing the basses, and not just one, my mind jumped back to 1980 Frankfurt Germany and realized that Bobby meant the Gamba basses as the cheaper ones. The nicer golden varnished Violin models came from Wilfer, and not all of the carved basses. There are some of the lower and mid models with medium to high flame in both Gamba and Violin shape as well as 3/4 or 3/4 shape so there were quite a few models available. It would be hard to say who made the middle models, especially the violin shaped ones. \nI believe that Bobby Juzek was born in USA just prior to WWII so he only knew what he had heard around the shop about who made what from before he was born or was just growing up. \nWhat I do know is that I have seen a bass and cello of theirs labeled Anton Wilfer from about 1936 or 1939 that were their top of the line models. 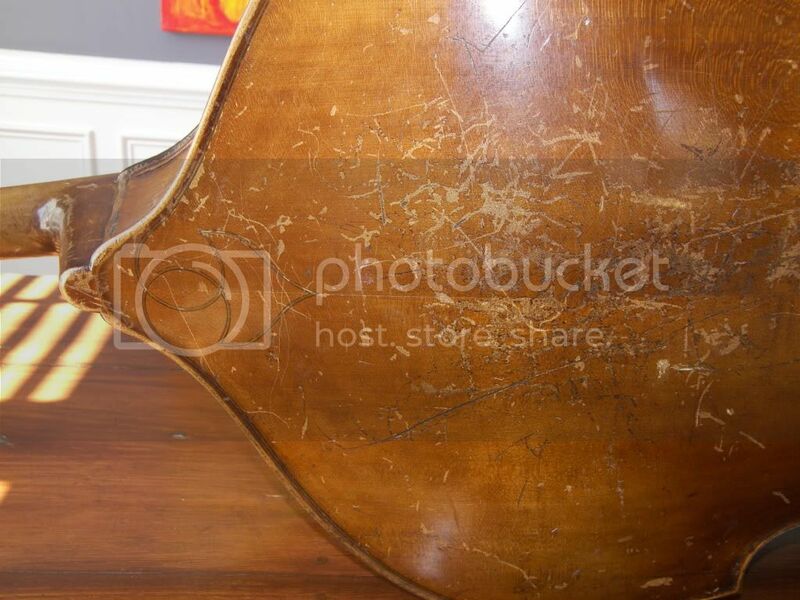 I have also seen a couple of post war basses IN their shop, (one of which I bought) labelled Wenzel B Wilfer. None of these had Juzek labels but were made for them and had come in with these labels Europe. \nSo, the Gamba basses we have seen for years with that flattish shaded brown varnish is a dead ringer for the Lang shop in Schonbach near the Czech/German border. \nThe Bass I just got needs a restoration. Since it\'s a 4/4 model (7/8ths by USA standards) with a string length over 43" at the notches, a modification to shorten the length would make the bass easier to play with today\'s modern requirements. I have taken several measurements of the body, neck, and block area and we have a few ways to go about this. Since I currently have over a dozen basses in repair/restoration already at this time, this bass will sit around for quite some time till we can get to it. \nThe body shape itself seems to be very close to the 3/4 model but the upper bout/neck block area has this long upward sweep lengthening the Top to about 45", about 1 1/4" longer than the 3/4 model. The purfling design on the back button according to one German shop is called \'Blume\', meaning flower. \nI have seen about 4 different but similar designs on basses with Juzek labels. \nSome of them look exactly like Hofner\'s so I am confused there because I think if labeled, these could be put in by dealers and if not labeled, mis-attributed. Also, 100 years ago, both Hofner and Framus (then just Franz Wilfer) were violin shops in Schonbach. The second generation of these families I believe brought them into the Guitar business. Germans did however always make guitars as well but before the electric craze, these were just local brands. The Beatles made Hofner famous and at the same time, killed their name in as much as concerning the violin business internationally from what I see. So, a Hofner is as good as any other shop brand in my opinion. \nThe next and most common design is the regular Juzek Flower seen since the earliest basses that look to me like Lang basses because I have seen them on Lang\'s as well. \nThe other early design is more squashed in design and not as much upright. These might be Lang or even another shop. I have seen a similar design in a larger shape on some Bohemian basses of the period. So that one might be early Lang. \nThe last of them is the fancier one we see today on the E. Wilfer basses but also on the Wenzel Wilfers and the earlier Anton Wilfers. These are all the same. So, that design whether Gamba or Violin shape in plain, medium or high flame are the Wilfer family made Juzeks or just, Wilfers. \nOk, I have collected some pictures off the internet, 2 of them were mine so I borrow equally. Here are 5 designs, 2 of them are not Juzeks, Wilfers or Langs in my opinion. \n1, this is a Czech flatback I had. I have seen many basses from Bohemia with similar but not exact designs. \n2, this is a Hofner and I have seen people calling these Juzek\'s but in error. If they had a Juzek label in them, then they were probably put in there by someone other than Juzek in NY. I have no knowledge of Hofner selling to Juzek and I even once asked Hofner and they said \'no\'. \nNot a single Juzek was ever made in Prague to my knowledge. Being born or having worked in Prague is one thing. Importing high volume of instruments has to be from an area that makes them and Prague is not that area. If it were made in Prague, the label would be in Czech and say just Praha, and not "made in". \nThese were made in many models and sizes before and after the 2nd war. Values today do not reflect the price list from Met. Music/Juzek. They sell for what someone can get for them. Often over and under priced because there is no regulation, period. You can by an Amplifier or Watch or Computer and know the average price and get a good or at least a fair deal. When buying a bass that is famous for being sold to High Schools, you get a factory/shop made bass that was produced for export for a low price regardless of how well the have aged and/or survived. \nThings that hurt the value are poor condition, bad repairs, long string length, low neck overstand and poor quality sound. \nThe mystique about the Juzek Master Art model makes me laugh and cringe as well, sometimes at the same time. I see dealers and players selling basses claiming to be a M.A. model. A Master Art model has Violin Corners, the Highest figure Flame maple, un-shaded golden or golden-brown varnish and, individual German made, french style tuning gears in Chrome. I have owned two of them, one by Anton Wilfer 1936 and one by Wenzel B\' Wilfer that I knew in the shop from 1966 and bought it in 1971/72. Neither of these had Juzek labels because they were too nice to cover up. It would be like bronzing a Gold medal. The rear emblem on a M.A. model is #4 above. If you see or have a bass that you think is or is labeled as a M.A. model and does not have all of what I just described, it is NOT. I have seen many basses with that label that were put in by someone that just do not match the bass, sorry. Concerning the old Benedict Lang stamp, here are 2 pictures I just found on-line. One with the brand in the upper back and one stamped within the \'Blume\' as used on Juzek basses. This second picture helps to \'connect the dots\' between Lang and Juzek. [quote=Ken Smith;26555]The purfling design on the back button according to one German shop is called \'Blume\', meaning flower. \r\nI have seen about 4 different but similar designs on basses with Juzek labels. \r\nSome of them look exactly like Hofner\'s so I am confused there because I think if labeled, these could be put in by dealers and if not labeled, mis-attributed. Also, 100 years ago, both Hofner and Framus (then just Franz Wilfer) were violin shops in Schonbach. The second generation of these families I believe brought them into the Guitar business. Germans did however always make guitars as well but before the electric craze, these were just local brands. The Beatles made Hofner famous and at the same time, killed their name in as much as concerning the violin business internationally from what I see. So, a Hofner is as good as any other shop brand in my opinion. \r\nThe next and most common design is the regular Juzek Flower seen since the earliest basses that look to me like Lang basses because I have seen them on Lang\'s as well. \r\nThe other early design is more squashed in design and not as much upright. These might be Lang or even another shop. I have seen a similar design in a larger shape on some Bohemian basses of the period. So that one might be early Lang. \r\nThe last of them is the fancier one we see today on the E. Wilfer basses but also on the Wenzel Wilfers and the earlier Anton Wilfers. These are all the same. So, that design whether Gamba or Violin shape in plain, medium or high flame are the Wilfer family made Juzeks or just, Wilfers. \r\nOk, I have collected some pictures off the internet, 2 of them were mine so I borrow equally. Here are 5 designs, 2 of them are not Juzeks, Wilfers or Langs in my opinion. \r\n1, this is a Czech flatback I had. I have seen many basses from Bohemia with similar but not exact designs. \r\n2, this is a Hofner and I have seen people calling these Juzek\'s but in error. If they had a Juzek label in them, then they were probably put in there by someone other than Juzek in NY. I have no knowledge of Hofner selling to Juzek and I even once asked Hofner and they said \'no\'. Visit Ruben E garcia\'s homepage! Basses like these were also sold under different brand names as well. The shops making them were not exclusive to one customer from what I have seen. \nSometimes the same exact models would show up with different or no labels in them and sometimes basses that look to be from the same shop but slightly different are found as well. \nThey all work good for most things but rarely seen in a professional orchestra. I went down to Metropolitan Music at 222 4th ave, NYC and got my first Bass. It was the basic Plywood with cover, Seifert Bow, Petz Rosin, music stand, rock stop and Tuning fork. With Tax this ran about $192 and change. The Bass itself was $150. The lowest priced carved Bass was $200 and was out of reach with what I had saved. Later on after selling that Bass to a Music store and owning an old German/Czech Juzek style shop Bass, I went back and bought their Master Art 3/4 model. They only had one like this and a 7/8ths as well in the back warehouse. After school over the years I had gone down there to look at the other Basses and just waited till the time came when I could get one. It was in 1971 right after recording the MMO records I had done that I went Back for the Bass I had seen since at least 1966. This was the Juzek family selling these as Met. Music was the business they had started about 40+ years earlier. The eldest there was Robert Juzek (brother of John Juzek, the labeled name) and his son Bobby Juzek would always be there working the counter if someone walked in. I told him I wanted to finally buy that Bass in the back so we both walked over and I pointed it out. The 7/8ths next to it had WBW in black script engraved under the famous Juzek emblem. At that time the 3/4 Master Art was listed for $1700 in their catalog on the front counter. Everything was 50% off from them regardless of who you were. Maybe dealers or stores got a little more off but I remember that my old mentor, Luthier Andre' Fantoni hated them because he would sell at almost the same price he could buy it for. Met. Music sold Spirocores then for $12 and at the shop Fantoni got $16 because he bought from a dist. and had to mark them up a little. Met.Music bought directly from Thomastic as a dist. but sold direct to the public. When Bobby went to tell his dad I was buying this Bass he threw a fit right in front of me yelling in Czech nearly scaring me into soiling my pants! Bobby came over to me an explained that this was an old bass and they can't get these anymore. They would have to charge me more if I wanted it as the catalog on the counter was very old as were the prices. The $1700 was a net of $850. He told me his dad wanted $875 for the Bass. Whew.. .. Only $25 more.. Ok.. sure.. So I pulled out the cash I had saved and paid for it. They put the bridge in place and strung it up for me. While testing it out the D string sounded funny. I was by the long workbench that lined the back wall/windows with a worker every 6-8 feet or so adjusting mainly violins for orders and a cello or two. By this time, I had read Elgar (had just turned 20) and learned a few adjustments myself. I asked the worker closest to me if I could borrow his rat tail file for the bridge and pointed to it. English was NOT the language spoken in that shop by far. He handed the file to me, I took off the D, filed the angle a little different into the tailpiece and fingerboard and then tuned the D back up. Now the Bass sounded better as the D slot was now angled correctly facing the tailpiece. The worker looked at me and nodded with a 'hummm' (like this kid knows something). A year or so later I was in a car accident and the Neck was broken damaging the ribs at the block as well as the Top and Back. Victor Venegas told me to call Alfonse Vavra as he was the best guy for the job. When I called him, he tells me he is too busy and to take it to his friend Peter Eibert who was just as good in his words. I get a ride up and when he comes to the door I was shocked but pleasantly. It was the guy from the workbench at Juzek that I borrowed the File from. Peter went on to do quite a few repairs over the next few years on some Basses I had acquired and learned a bit from him as well. He was from Germany having worked before for Heinrich Lang in Nuremberg since the age of 14 and he was 25 years older than me as well. 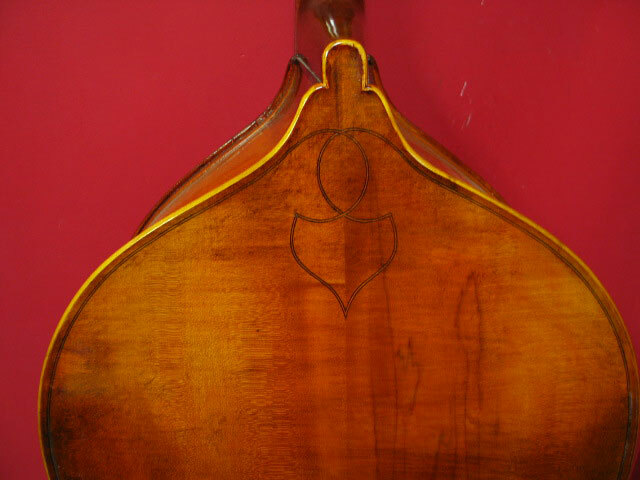 His master was related to the Langs that made the early Gamba and Plywood Basses for Juzek and my Master Art was actually labeled Wenzel B. Wilfer. A few years later I picked up a 7/8th Juzek type Master Art and it was labeled Anton Wilfer. This was the same as my 1966 WBW but much older and a richer looking Varnish. Peter Eibert would go on to tell me the story about the Juzeks and the history of their import business. Although the history is on the MetMusic website, learning from one of the elder workers knowing the Juzeks from both USA and Germany (after WWII) I was able to map out just a bit more than the average person. John Juzek had never made a single Bass as he was a violin maker and may have made a cello or two. After WWI, John and Robert (and possible a 3rd brother) made an import business of Violins and later added Basses as history shows us but there are no dates recorded. I cannot say that I have seen many Juzek 'labeled' Basses from before 1930 but I am sure a few were purchased for the US market at some point in the beginning. These were mainly for the Schools as they were considered student instruments. Orchestra professionals bought older Basses back then and before long war broke out in Europe. This was the reason that Kay started making Basses and Cellos because exports had stopped from Germany and Czech. I went to Music & Art High School and all but one or two Basses were Juzeks as well as the other String instruments. Today we see these basses used and favored by many Jazz players and as 2nd Basses for some Orchestra players as they have mellowed over time with many Basses being 40 to 70 years old. For the record, the finer carved Basses bearing the Juzek label were made by 3 generations of the Wilfer family being Anton, Wenzel and Emmanuel. I have learned that this cottage industry of making was centered around Shoenbach bordering both Germany and Czechoslovakia. After WWII, many of the workers moved over to the German side to avoid communist rule. At this time Robert Juzek made direct contracts with the shops and pushed his brother John out of the business for whatever reason. Robert was always the main brain in the family business traveling back and forth to Europe to the shops for instruments. In conclusion, if you have a Bass labeled Juzek it was most likely put on here in USA and made by one of the Wilfers for the most part. They did buy from others if needed from what I have heard but even some of those could be Wilfers made for another importer. Most pre-war models were made in the 1930s in both Czech and Germany but after WWII, all the Basses were coming from Germany. The bulk of what I have seen have been German made post WWII but I have seen at least a dozen older Basses that I suspect some could be from the 1920s. For other Shop type Basses, read about Pfretzschner/Morelli here..